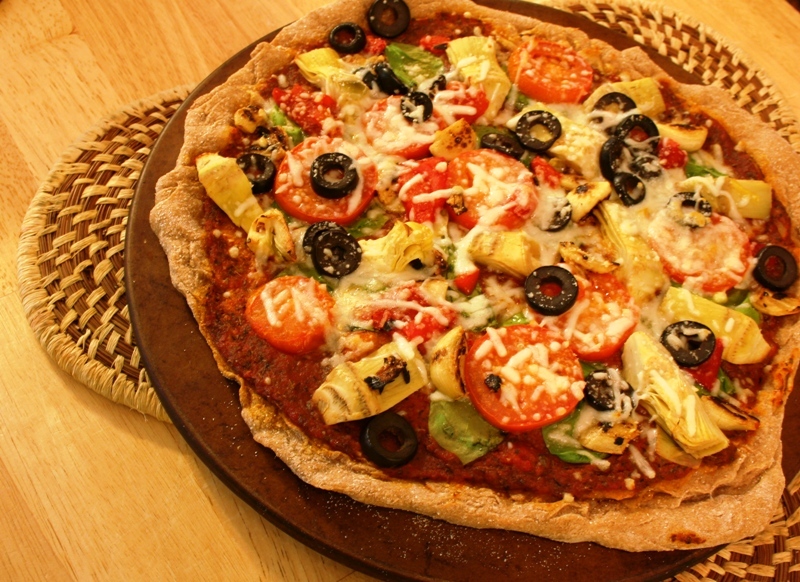 Utilizing a basic whole wheat dough recipe, this vegetarian pizza was full of flavor and healthy too. Packed with lots of fresh vegetables and an oil-free and salt-free tomato sauce. The thin whole wheat crust is cracker-like and crunchy. And while the pizza dough does contain 1 teaspoon of salt and 1 tablespoon of olive oil, the amount is not enough to break the bank on the Eat To Live diet plan. The dough makes enough for two pizzas, and when you considering that you can feed four people with this batch of dough, the amount of salt and oil consumed is minimal. This recipe is adapted from the book American Wholefoods Cuisine, by Nikkie & David Goldbeck, and found on pages 219 – 210 in the hardcover, 1983 edition, which I have cherished since the day I put down $17.95 for my copy some time ago. Indeed, my passion for wholefoods cuisine began at home in my formative cooking years even before the professional apprenticeship. The Goldbecks were way ahead of the their time back then, and I am happy to report that they are still alive and well promoting their spirit and healthy lifestyle online at Healthy Highways. The trick to restaurant quality pizza at home is a high temperature oven, a pizza stone, and a pizza peal. 1 Cup Water, warmed to 115° F.
1. In a large bowl, dissolve the yeast into the warm water and allow to sit for several minutes, then add the salt and honey and stir well and allow to sit for about 5 minutes allowing the yeast to activate. 2. Add the oil to the liquid, and then add two cups of the whole wheat flour and beat with a wooden spoon by hand until the dough becomes too stiff to turn. 3. Transfer the dough to a surface dusted with more whole wheat flour and knead in the remaining flour until smooth and elastic, or about 5 to 8 minutes. 4. Place dough in a lightly oil large bowl and coat the entire surface of the dough. Then cover with a kitchen towel or cloth, and allow to rise in a draft free area or warm proofing oven (130° oven) for 2 hours, or until doubled in volume. 6. For two large pizzas, roll each half into a 12 to 14-inch pizza circle. If only making one pizza you can wrap the other half of dough in plastic and keep refrigerated until ready for use. 7. As you roll the dough it should be about ¼ thick and turn it over several times to make it easier to shape. Building and baking the pizza Note: Pre-heat oven to 425° F.
1. Evenly sprinkle some of the cornmeal onto the pizza peal. The cornmeal acts like tiny ball bearings that allow the dough to easily slide onto and off of the peal and the stone. Place the shaped pizza dough onto your pizza peal and start with adding your tomato sauce then toppings and cheese. 2. Make sure that your pizza stone is pre-heated in the hot oven, and then slice the pizza off the peal and onto the not stone. Allow to bake until the cheese melts and the crust is browned, or about 10 to 15 minutes. 3. When done you can slide the pizza peal under the pizza and transfer to a serving platter or pizza pan. Allow the pizza to cool for several minutes, and then slice into 8 pieces. The tomato sauce consisted of 2 cups of fresh fire roasted tomato sauce with some Italian seasonings and some toasted minced garlic added. Our toppings are fresh spinach leaves, artichoke hearts, black olive slices, plum tomato slices, toasted garlic cloves, and roasted red bell peppers. We also added a small amount of shredded mozzarella cheese. This recipe was prepared on Eat To Live, Week 2 Recap, and linked from Eat To Live, Week 2 Recap of our ETL diet and lifestyle, you can follow our complete progress at Eat To Live. this looks delicious! 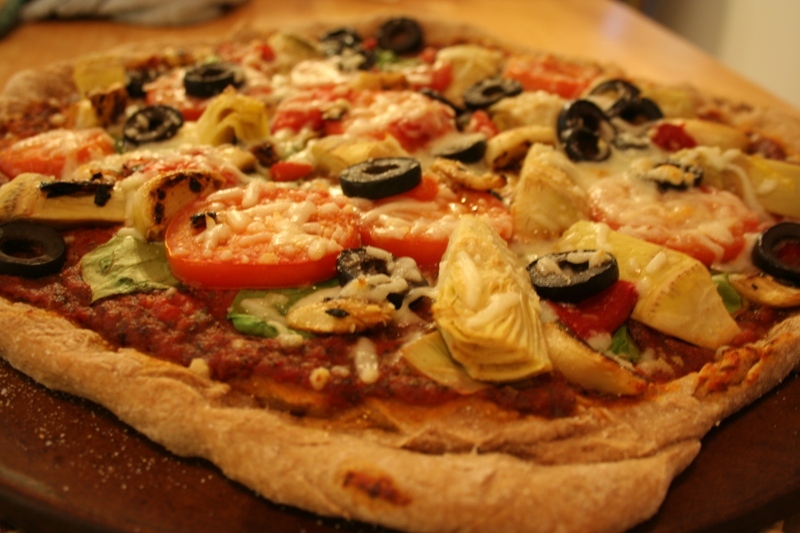 Daniel and I are big fans of homemade pizza, and whole wheat crust is a nice alternative. it’s good to see so many different veggies and such a great flavor combination on yours! Great pizza. Home made is the best ever when a stone is used. I agree a peel is a must. My brother tries to con me out of mine every time he visits. This is packed with so many healthy veggies and wonderful flavors. Well done! I have never made wholemeal pizza bases before. It is a healthy alternative. That is my favorite kind of pizza. It’s beautiful!!! as I’m sure delicious. Oh, I can’t even imagine how good that has to taste! Well.. yes I can.. I just saw this post. I happened to make a wholemeal pizza around the same time. Do check it out and give me your valuable opinion.